Wow! That there’s a mighty nice gross head wound. I went through a multi year phase where I ONLY liked to dress as something gory. 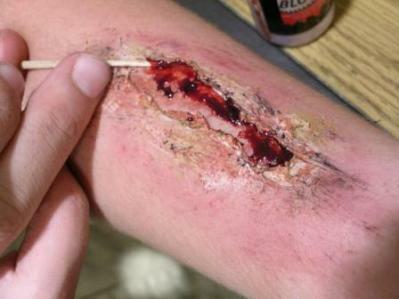 Once, going to a last minute Halloween dance, I dressed up in the car, and managed to look very gory. cool wound! instead of unflavored gelatin can you just use regular red jello? Yes, you can, but you end up smelling like Cherry Jello all day/night. Trust me. Use the unflavored gelatin.